Contact All American about your FPS Pre-Qual Firearms Training, all previous students get an additional 10% discount! Over the past several years we have enjoyed a 98% success ration for our students on Qual day. We are taking registrations for our next Executive Protection class, make sure to call today. Note : If you have 6 or more people that want their own class in any category, call to make arrangements. We need a minimum of 8 days prior to the class, to notify The Department of Criminal Justice Services of the class dates and schedule. All prices are based on a minimum class size of 6 students. Smaller classes are available at an increased rate, call for pricing. All American Bodyguard Training is provided at All American Training Center which is a full service training agency headquartered in the Commonwealth of Virginia, with both national and international affiliates. It is registered and licensed, and has offices in the State of Maryland, the District of Columbia, the Commonwealth of Virginia and in other locations. All American Training Center provides its clients with services matched by few and surpassed by none. It is staffed by dedicated professionals who provide specialized skills to resolve problems that elude others. It's operatives have backgrounds in training with the FBI, CIA, NSA, DEA, DHS, Secret Service, Police Departments, military and various corporations. All American Training Center, located in the Commonwealth of Virginia, operates an established modern training facility featuring a secured classroom and exercise arena where students benefit from both lecture and practical exercises. All American Training Center performs the required fingerprinting and photos for Virginia DCJS and Maryland State Police security registrations. 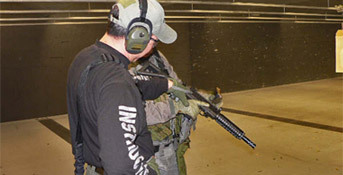 All American Bodyguard Training Center is one of the few Bodyguard Training Centers that each graduate leaves with a training certificate, suitable for framing, approved by the Department of Criminal Justice Services of Virginia. The certificate shows each graduate has met the requirements of the state. This in itself makes it worth the investment to train where your training is recognized by the Department of Criminal Justice Services of Virginia. CPR/AED & First Aid certification cards are issued on the day of the student's successful completion of the required exam. The certifications are for 2 years. This class is included in the Bodygurad course, but is also availble as a separate course. Learn to work as a team member. Learn the proper formations so You can work with other teams. Know what it means to do an advance for a client. Learn how to do route surveys. Lean how to avoid confrontations before they happen. Learn tactical defenses. Learn how to give medical aid if and when it may be needed. Learn how to make and provide surveys to your client. Learn driving formations, when and how to use them. Learn to work with local law enforcement in your assignments. Learn how to price your services. Learn how to use your best weapon, your mind, in a time of crises. Learn how to run your own bodyguard detail and learn how to start your own business. Best yet, learn how to stay alive and keep your client safe. By understanding which is more important the clients comfort or the clients safety and what to do in any crisis is the goal of All American Bodyguard. Learn how to stay alive for another day by using your mind, not weapons or physical power, but mental power. By knowing how to use your mind as your number one weapon you are able to keep yourself and your client alive for another day. We teach many diffrent weapons disaraments for all types of weapons which are even faster than the one shown in the video. For the protection of the industry, your clients and ours we do not offer any videos showing any of theses. It is our hope if you decide to become part of the Security industry you will consider training at All American. Remember Your MIND is your number one weapon. Welcome to All American Bodyguard Division! Call today to start your new career in Life Insurance! Over the years 98% of our students that have taken our FPS Pre-Qual class pass the first time thru on Qual Day. When they shoot in front of the FPS Inspector, they are prepared and ready. 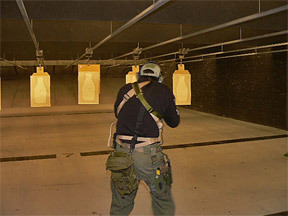 We provide instruction and evaluation of each students shooting skills during Pre-Qual Training. We not only explain how to shoot the course of fire, but how to shoot it in a proper and safe manner. We save students and companies money everyday!